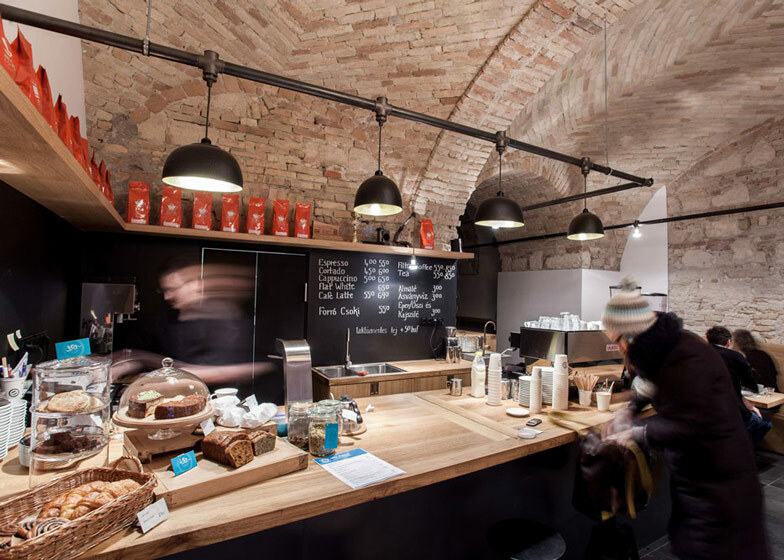 Following our earlier story about a tea house in Prague, here's another cafe with vaulted ceilings by Hungarian studio Spora Architects, in a two-hundred-year-old former palace in Budapest (+ slideshow). 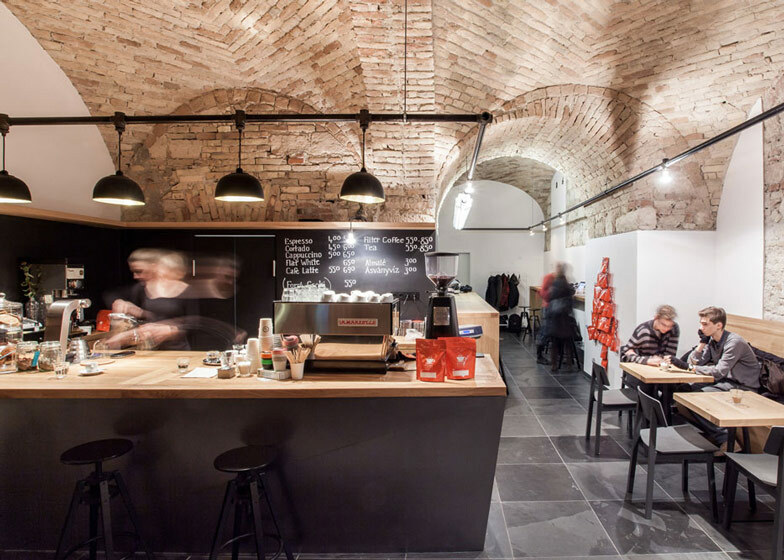 Spora Architects designed Embassy Espresso as an artisanal coffee shop in the basement of a former nobleman's city palace, and architect Ádám Hatvani told Dezeen the space is suspected to have been originally used as a stable. "We know that in this kind of palace from time to time the ground floor was the place for the guard, the servants, horses and carriages," Hatvani said. "We found some holes in the walls that are probably the places of the barrier beams, usually between the horses and the stable." 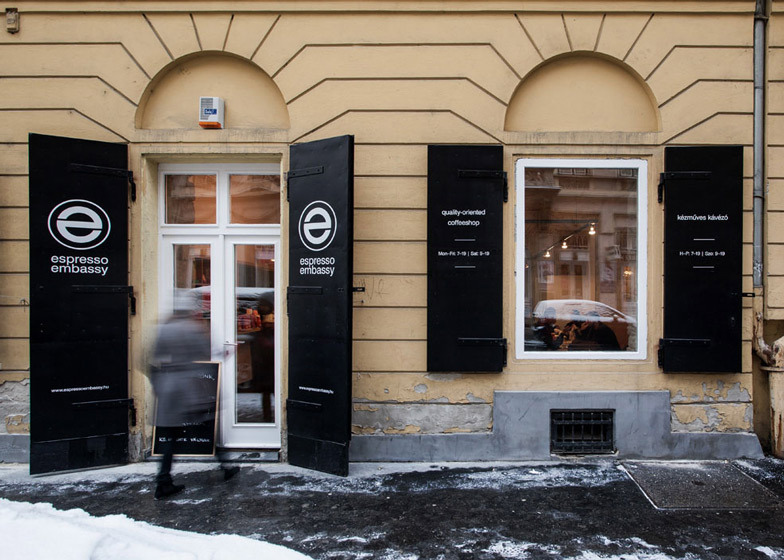 Located in the financial district of downtown Pest, the cafe's existing doors and window shutters open the space out to the street. 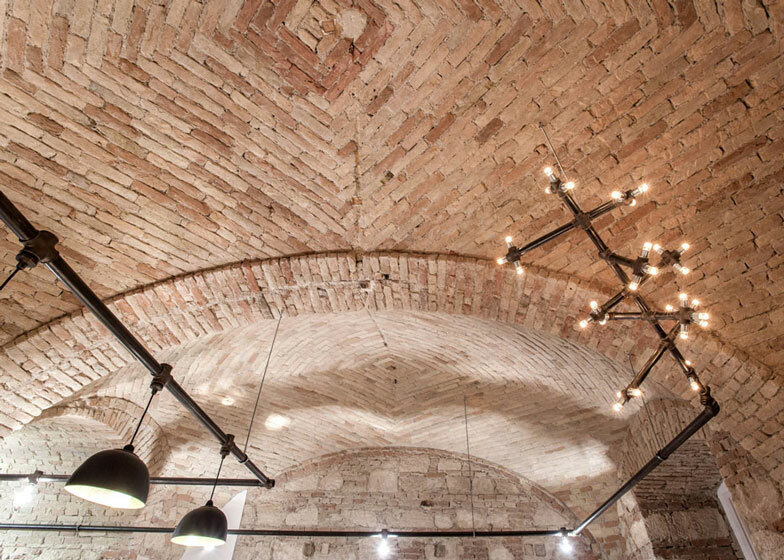 Inside, the architects uncovered the original vaulted brick ceilings and exposed walls built from a mixture of brick and stone. Pipes run along the upper parts of the walls and extend outwards to form splayed lighting installations, as well as to support hanging pendant lights and simple bulbs. "There are four different types of lights installed; in the pipes are cables for the lamps so there are no visible cables or installation elements in the cafe," Hatvani explained. Wooden benches are positioned around the edges of the cafe. The serving counter is made from wood and is fronted by black steel barstools and chairs. The floor is covered with natural black slate tiles. Photography is by Danyi Balázs. 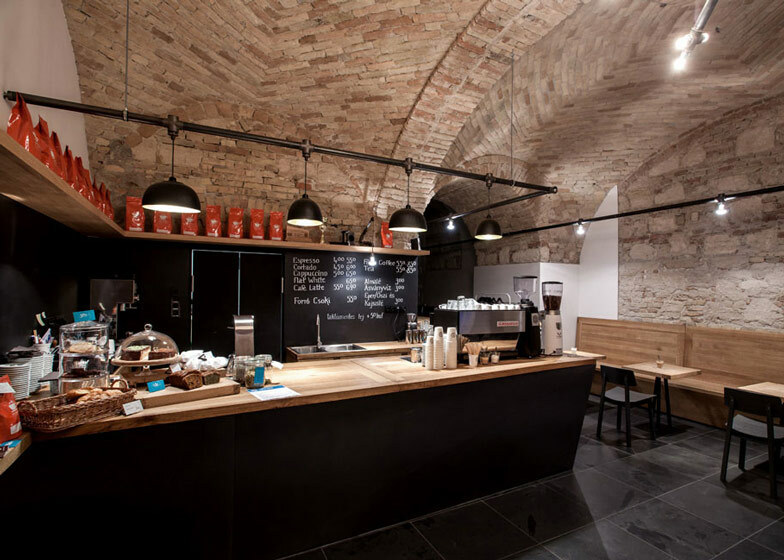 Take a 80 square meter ground floor flat in the downtown of Budapest, and transform it into an artisanal coffee shop, for one of the world's best baristas. The building is an urban palace, with beautiful classicist detail, structures of that period, today a residential house. This was before the artisanal coffee revolution of quality, simplicity, inviting interiors. This is the background in which Espresso Embassy was spawned. After cleaning up the structures, hidden beauties were uncovered. 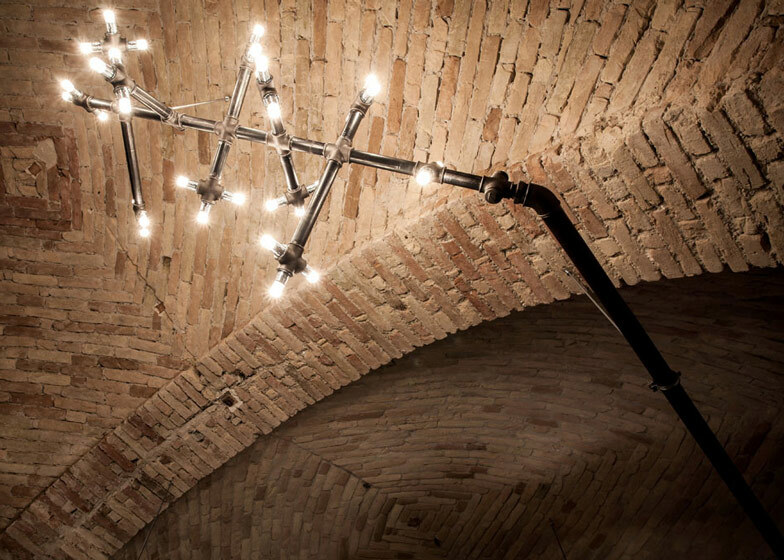 Bohemian spherical brick vaults, stone-brick mixed walls. It turns out the space might have been a stable, this is where the mysterious little gaps in the wall could have come from: holding the walls between two horses, or the timber for the loft on which hay was stored. All this in great condition. Almost finished. What was needed to add, was a simple black stone floor, furniture made of oak and steel, unique lighting from water pipes. Everything is from what it seems. Material thickness, bricks, stone, oak, raw steel, slate, and the white and black rendering on some parts. Everything else is the work of hospitality. It is as if we were in a two hundred year old inn, where there is wifi, filtered water for the guests through a tap made of copper and a bowl of concrete, high quality espresso machine, überboiler, milk patterns on cappuccinos, quests with laptops and tablets, breakfast-goers, cultural nomads, urban coffee lovers, intellectuals, businesspeople, bankers, university goers, Hungarians and foreigners: it's the city.